Internally displaced persons waited to be served with food at Dikwa Camp, in Borno state in north-eastern Nigeria last month. MORA, Cameroon — At first, the attack had all the hallmarks of a typical Boko Haram assault. Armed fighters stormed a town on the border with Nigeria, shooting every man they saw. But this time, instead of burning homes and abducting hostages, the fighters gathered cows, goats and any kind of food they could round up, then fled with it all. Boko Haram, the Islamist group terrorizing this part of the world, is on the hunt — for food. After rampaging across the region for years, forcing more than 2 million people to flee their homes and farms, Boko Haram appears to be falling victim to a major food crisis of its own creation. Farmers have fled, leaving behind fallow fields. Herdsmen have rerouted cattle drives to avoid the violence. Throughout the region, entire villages have emptied, leaving a string of ghost towns with few people for Boko Harm to dominate — and little for the group to plunder. Across parts of northeastern Nigeria and border regions like the Far North, trade has come to a halt and tens of thousands of people are on the brink of famine, U.N. officials say. Markets have shut down because vendors have nothing to sell, and even if they did, many buyers have been scared off by the suicide bombers Boko Haram sends into crowds. The hunt for food appears to be part of what is pushing Boko Haram deeper into Cameroon, according to a U.S. State Department review of attacks in the first few weeks of this year. Such attacks are becoming increasingly common in the areas bordering Boko Haram’s base in northeastern Nigeria. A military campaign by Nigeria and its neighbors has chased fighters from villages they once controlled. Now, officials contend, the militants are left to scrounge for food in the sparse Sambisa Forest during the dry season, or go out raiding for whatever they can find. This week, dozens of emaciated Boko Haram fighters, along with captive women and children, surrendered to military officials in Nigeria, a situation the authorities expect to repeat itself in coming weeks. 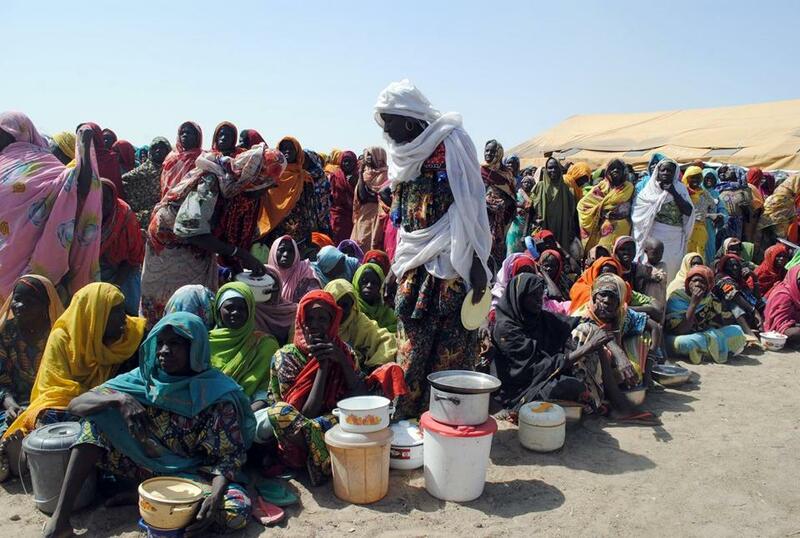 “They have nowhere to go,” Abubakar said. By early February, Boko Haram was estimated to have stolen at least 4,200 head of cattle in Cameroon. In one attack in early January, the militants descended on a town in Cameroon and took dozens of bicycles, wheelbarrows, and 150 small animals like sheep and goats — and then kidnapped six people to help lead the animals back into Nigeria, according to the State Department review. Boko Haram has also taken hostages and forced them to raid cattle from other villages, it said. But while some elements of Boko Haram may be battered, fighters still manage to carry out devastating attacks, the results of which are on full display at the hospital in Maroua, the capital of the Far North. Shrapnel and burn victims from recent attacks across various towns recuperate together. One young woman lay in a coma, her hair arranged in perfect skinny braids. Until last summer, when the suicide attacks in Cameroon’s Far North began, the most common ailments at the hospital were stomach trouble and motorbike mishaps. It didn’t even have a surgeon. Doctors Without Borders arrived to set up a large triage tent, and in January, a team from the Health Ministry flew in to train workers in treating war wounds. Now the hospital has been converted into a conflict zone clinic, with a full-time surgeon and more to come. Recent joint operations by the Cameroonian and Nigerian militaries have captured and killed numerous fighters and seized suicide belts, weapons and equipment for making mines. Officials hope to squeeze the fighters from both sides of the border so they have nowhere left to run. But the multinational military force — which includes Chad, Niger and the U.S. military in an advisory role — sometimes has trouble securing territory once it is cleared. In Cameroon, soldiers drove Boko Haram fighters from the border town of Kerawa in October, but it has since been assaulted at least six times, with militants beheading a young man in one attack. Early last month, a suicide bomber entered Kerawa and blew himself up behind a house, killing a tailor. According to a State Department report on the episode, the bomber had been looking for a large group of people to kill, but after all the attacks in the town, the streets were empty. The mass displacement caused by Boko Haram — and by the sometimes indiscriminate military campaign to defeat it — has left 1.4 million people in the region without adequate food supplies, the United Nations says. In Borno state in northeastern Nigeria, where the situation is the most acute, humanitarian workers say that 50,000 people are one step away from famine. Along the Chadian border, farmers typically trade their pepper crops for imported cereals and grains. But the pepper fields have been abandoned and there is little left to trade. In the Far North of Cameroon, this time of year is a moonscape of bone-dry river beds and clouds of dust so thick they look like misty fog. The region is moving into the lean season, the in-between months when the fruits of the previous harvest are being depleted and next year’s crop is not yet ready. Last year’s harvest was already smaller than usual because of low rainfall. Water tables are low, and worries are mounting about an adequate supply of drinking water, especially at the refugee camp here that has new arrivals daily. About 55,000 refugees from Nigeria have taken shelter in the camp, while 158,000 Cameroonians have been scattered across villages, often crammed into tiny shacks with relatives and strangers until they can safely return home. Mariam Yaya was in Kerawa when Boko Haram came for the livestock. Her uncle and his two children were killed. Her husband survived because he, like many other men who knew they might be targeted by militants, had retreated to the forest, where he slept in case of a Boko Haram attack. People in the small village of Mora, which has doubled in size in recent weeks with new arrivals, took pity on Yaha and her three children and built them a home from mud here. Despite the influx of new people, officials closed the town’s market out of fear that it would be attacked. Boko Haram had struck a satellite village just days before. Residents now worry that the market will remain shut for weeks. The food crisis is part of broader economic devastation in the area, adding to the burdens on Cameroon at a time when it is hosting thousands of refugees fleeing a religious war in nearby Central African Republic. The flood of Nigerian refugees into Cameroon is creating hard feelings. Even a religious leader who attends births and marriages in the Minawao Refugee Camp said the refugees needed to go home. The United Nations accused Cameroon of sending tens of thousands of refugees back to Nigeria at the end of last year. The government has since said it would involve the United Nations in any plans involving the refugees’ return. Tourism has plummeted in Cameroon, which has such diverse ecosystems and a range of wildlife that it refers to itself as Little Africa. Guides who once led visitors to see lions and elephants in Waza National Park in the north now scrape by with occasional work building new homes in the Minawao Refugee Camp. Even elephants are affected by the Boko Haram food crisis. Herdsmen driving cattle from Chad to northern Nigeria now detour south, across Bénoué National Park, where cows compete with a dwindling elephant population for food. And with many herdsmen cut off from markets in the struggling Far North, wildlife workers fear they may discover a new, more lucrative trade: ivory poaching. Last week scientists flying over the Bénoué park spotted two elephant carcasses.